Firstly I want to say thank you for your patience with me in getting all my documents in order. I want to congratulate and praise you for the coordination and execution of this experience for me. From the welcome at the Euro star in Paris, travel to the hotel, hospital and back, has just been one great journey without any problems. The hotel was comfortable and staff were very helpful and pleasant, everyone there just knew what to do. Taxi service on time every time knowing where to drop and collect you. The staff at the hospital where the consultation was done, even when there was a lack of communication with language barrier, everybody just knew what to do, what and where to go next. The staff who assisted with when the endoscopy was done, they were amazing. Speaking of amazing, I want to say, my experience in the hospital itself was great, from being taken up, going to theatre and back to the ward, the nurses constant care, being there whenever you need them , I can only applaud them. But mostly I want to say thank you to Dr B. for his follow-up visits, making sure I was ok. Thank you for your calls back at the hotel making sure I was ok after the mini gastric bypass operation was done, for arranging the yogurt and soup, and checking to see if anything else was required. Thank you for making this Gastric Bypass journey so comfortable as possible for me, I can, and will recommend you and your team with highest praise. Here is Helens story It is nearly 3 months since my Gastric Sleeve surgery and life couldn’t be better. I get excited about getting dressed in the morning. I now take more pride in my appearance. 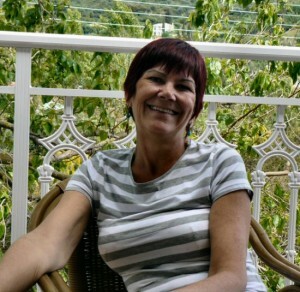 An Important update in May 2015 from Jackie who had a Mini Gastric ByPass Surgery. 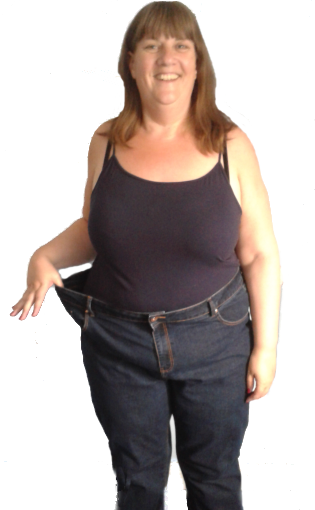 Mini Gastric Bypass Surgery date 3rd Sept 2014 Jackie has sent us “Just a quick update on her weight-loss. 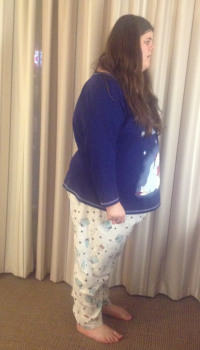 Kendyl B had a Gastric Bypass operation in France Date of Surgery 10th December 2014 Kendyl has kindly sent us a further update on her amazing weight loss journey following the Gastric bypass surgery which she had in December 2014. 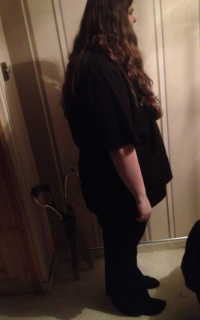 I am now 4 months in and I have lost nearly 6 stone. I currently weight 15 stone 3 pounds. Kendyl is only 16 years old but her determination to lose weight is so inspiring. Kendy told us that she had struggled with her weight since she was very young and that she had tried dieting and everything known to try to lose weight. 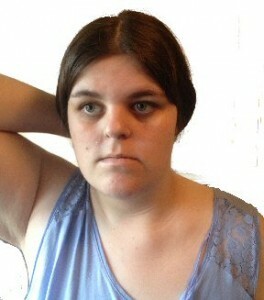 She used to comfort eat a lot due to bullying about her weight until she reached her biggest weight of 131kg (289 Lbs). Eventually Kendyl decide that she had to do something to change her lifestyle for the better. This is when she realised it had to stop Having searched online for weight loss surgery as a close family member had also had it done. 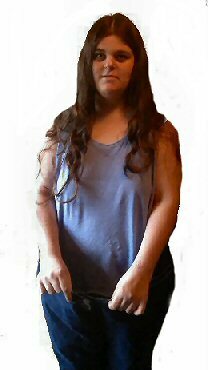 Kendyl realised that due to her age she could not get the Gastric Bypass on the NHS which is what she desperately needed until she was at least 18meaning she would have had to wait 2 more years during in which time she feared she would to just get bigger and bigger. “I am noticing the weight loss as well as my friends and family. We are pleased to hear again from Wilma MacD who had a gastric Sleeve surgery at our Hospital in Le Havre, Northern France, in September of 2013. Once again Wilma has been Kind enough to send us some Images of her before and after results showing the dramatic changes in 18 Months. As you can see from the images on the right the changes have been remarkable and Wilma is more than pleased with the results of the gastric sleeve surgery. Here is part of the E-Mail which Wilma sent to us.Hello Tullia, sorry for the delay in getting these pictures to you.I know there is a difference now because I have a waist again ! I couldn’t wear this denim dress before as I could not fasten the buttons. The gap across my tummy must have been a good nine inches! I now weigh less than 260 pounds. I am 44 and have no living memory of being thin. Despite being very sporty and fit I always remember being larger than my peers and being judged and ridiculed for my size. The dreaded back-handed compliment of ‘oh you have a lovely face’ was common. I have been on diets since the age of 8. I was diagnosed with a underactive thyroid in my mid thirties. I had the ability to lose weight, but eventually would pile the pounds back on and then some. Having witnessed my friend’s loose weight by way of a gastric band and gastric gastric bypass I decided to take matters of my own in hand. I dismissed having gastric sleeve surgery in an eastern European country despite it being a little bit cheaper, I felt the risk of flying so soon after surgery was too great. 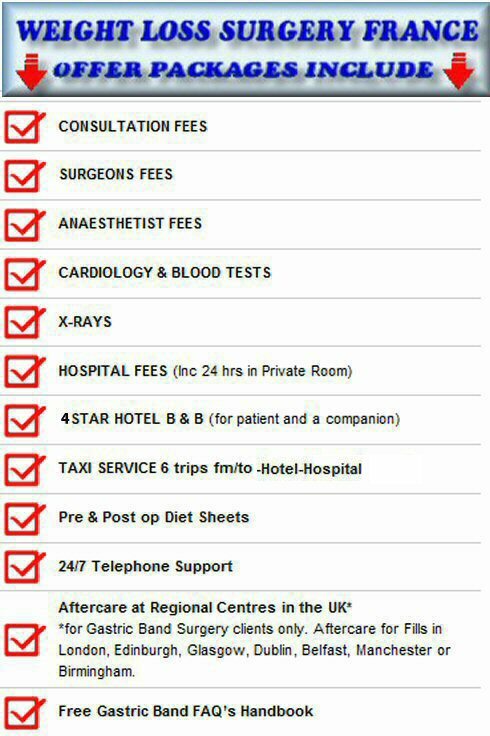 I could not afford the cost of bariatric surgery in the UK so this was not an option. I stumbled upon The Laser Clinic (France) Ltd by way of a google search. It immediately appealed to me as it was accessible by way of Eurostar. I made further enquiry, initially by speaking with Tullia and thereafter internet searches to satisfy myself the package offered was genuine. I had anxieties about paying so much money up front. I had anxieties about it being a sham, but after much research I could find no evidence that it was. Tullia was extremely helpful. At first she did come across as a bit aggressive, but this proved to be pure efficiency and her drive. 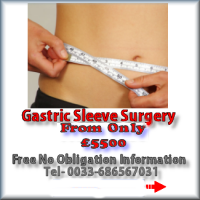 I had a gastric sleeve on 4th February 2015. I travelled with my husband and a friend who had the same surgery. I could not have been happier with the service and treatment we received. The 6 days flew by seamlessly. Everyone involved from surgeon to hotel receptionist were amazing. Transport arrived on time or early. On the 2nd February I met with the Surgeon, the Anaesthetist and Bloods were taken. We had the rest of the day to shop. The Hotel is situated on the marina at Le-Havre with a shopping mall just over the bridge. It is also only a short walk in to Le Havre where there are yet more shops. On the Tuesday we had the endoscopy. We were at the hospital for less than an hour. It was not a pleasant experience but it is a short procedure. We were collected on the Wednesday at 6.15. I was ready for surgery at 8 am. I was required to shower in a special ointment. (Make sure you don’t have any nail varnish or jewellery on). Also make sure you shave your bits!! The next thing I knew the Nurse was directing me to be taken back to the ward. Following the surgery I had four small wounds. I was in no pain. The four wounds were neat and healed well. I was up and walking the following day. I returned to work on the 9th February. I have lost 21 pounds and many inches in the first 2 weeks after having my Gastric Sleeve Surgery. 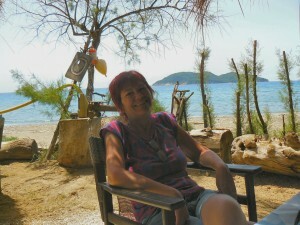 Hi Tullia “I have to say that everything was perfect from start to finish”. First contact was made from Tullia to check on medical conditions and weight etc. Once everything approved and money transferred it all got put into place with excellent communication by phone, text and email. We arrived in Lille on Sunday 1st February. On Monday morning we were picked up from our hotel for transfer to Le-Harve hotel. The taxi then picked us up to take us to the hospital for appointment with gastric sleeve Surgeon, the Anesthetist and the blood tests. The Staff were so lovely and friendly. After the appointments were completed the taxi picked us up again to return us to the hotel, when the afternoon was then free for us to relax. Again on Tuesday the taxi picked us up to take us to the hospital for endoscopy. Afterwards we returned to the hotel and again the afternoon was free. (Had by now built up quite a relationship with hotel staff and they also knew exactly what was happening and what we were doing) Wednesday was surgery day. Once again the taxi picked us up to take us to the hospital. We arrived at hospital on time – as always. The staff at the hospital were really lovely and understanding my English (it wasn’t an issue that I didn’t speak French). Went through the system to prepare for surgery with assistance from the nurses. Once ready, went down for surgery, and then after the surgery returned to the recovery room. I took a while to recover from Surgery but the staff were really understanding of this and really looked after me. They discovered through surgery that my iron levels were extremely low and gave me IV Iron. The next day to my amazement I was feeling a lot better and was up and about by midday. I departed from the hospital on Friday with medication and letters etc. and everything that was needed. on Saturday, after a visit to the hotel from the surgeon, we set off on our returned to England. Once again a taxi was pre-booked to take us back Lille to pick up the Euro-star. I couldn’t believe how comfortable the journey was. Things have only got better from then on. 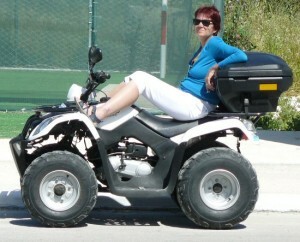 The services were excellent and taxis were always on time and the whole package was arranged by Tullia with expertise. It is now almost 3 weeks since my gastric Sleeve surgery and am moving around freely and doing a lot more in the house and sleeping better and I have now lost 6 kg (13.2 Lbs). Hi, my name is Kendyl. I am 16 years old and I live in England. I had weight problems since being very young and had tried everything in an effort to lose weight, yet nothing worked until I reached my biggest weight of 289 lbs. I traveled to Le Havre in France and underwent a gastric bypass operation on the 10th December 2014. All of the doctors that were involved in my surgery spoke perfect English. This made me feel comfortable. The gastric bypass surgery was a success and everything went to plan. In Just Under 3 Months I have lost 49 lbs. 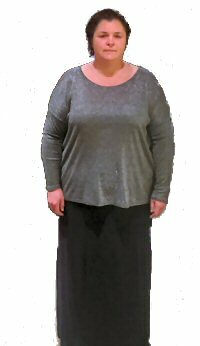 Its now late February 2015 which is less than 3 Months since I had the the gastric bypass and I am pleased to let you see my Gastric Bypass before and After Photos since I had my Gastric bypass surgery at the Hospital in France and I have already lost 49 lbs. and I am continuing to regain my confidence as I lose more and more weight every day. I am extremely grateful to the team at Laser Clinics ( France) Ltd for taking my situation into consideration giving me the help I needed. 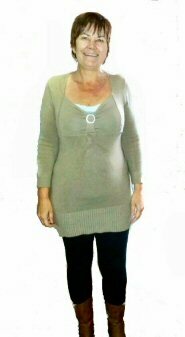 I will be posting more Gastric Bypass Surgery Photos onto this blog as the weight continues fall off. Full name details available on request. Hi, my name is Kendyl. I am 16 years old and I live in England. I have struggled with my weight since I was very young. I have tried dieting and everything known to try to lose weight, yet nothing was happening. I used to comfort eat a lot due to bullying about my weight until I reached my biggest weight of 131kg. This is when I realised it had to stop. I searched online for weight loss surgery as a close family member had also had it done. I realised that due to my age I could not get the surgery I needed in the UK until I was 18. In my eyes this meant I would have to wait 2 more years to just get bigger and bigger. This is when I came across a hospital in France that would happily perform the surgery for me. I travelled to Le Havre in France and underwent a gastric bypass on the 10th December 2014. All of the doctors that were involved in my gastric bypass surgery spoke perfect English. This made me feel comfortable. 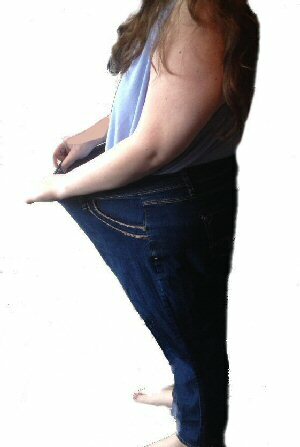 The gastric bypass surgery was a success and everything went to plan. 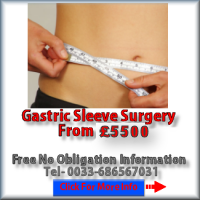 Within 3 days of the gastric bypass surgery I was heading home to England. In Just 3 Weeks (30th December 2014) I have already lost 9kg. I am already noticing the difference in my face and my shoulders. I am looking forward to seeing the progress continue as I gain my confidence back. I am truly grateful to Tullia and Dr B. for taking my situation into consideration and allowing me to get the help I needed. I will be posting monthly pictures onto this blog so you can see how quickly and dramatically the weight just falls off. A very big thank you from me for agreeing to operate on Kendyl even though she was only 16 years old. Everything you organized for us was great. Everything went according to plan with not a single fault. The 4 star Hotel was very nice, but more importantly the hospital was very good, the doctors and nurses were fantastic, all spoke English and they bent over backwards to make sure all went well. We could not have asked for a better team to look after my daughter. 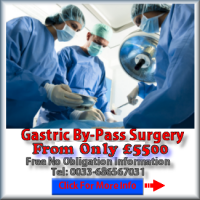 I would have no problem in recommending your team to anybody that is interested in the Gastric bypass surgery you offer.